, a celebrated architect and lover of classical antiquity, was born in London, in 1713. His parents resided in Creed-lane, Ludgate-street. His father, who was a mariner, was a native of Scotland, and his mother of Wales. Their circumstances were very narrow; but they were honest and worthy people, and gave their son the best education in their power. Mr. Stuart, who was the eldest of four children, was left utterly unprovided for when his father died. He exhibited, however, at a very early period of life, the dawnings of a strong imagination, splendid talents, and an ardent thirst for knowledge. 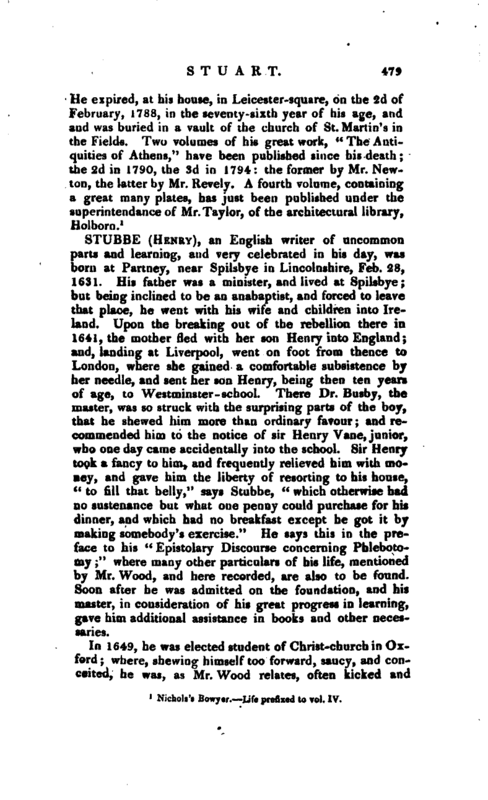 By whom he was educated we have no account; but drawing and painting were his earliest occupations; and these he pursued with such industry and perseverance, that, while yet a boy, he contributed very essentially to the support of his widowed mother and her little family, by designing and painting fans for a person in the Strand. He placed one of his sisters under the care of this person as his shop-woman; and he continued, for many years, to pursue the same mode of maintaining the rest of his family. 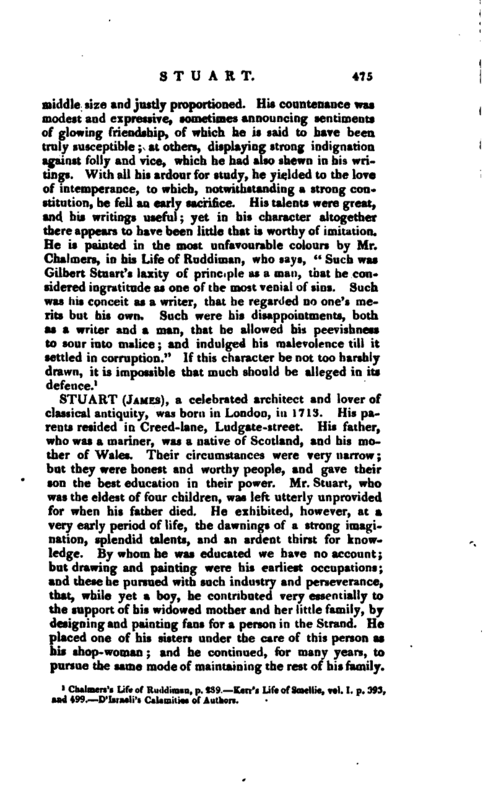 | Notwithstanding the great pressure of such a charge, and the many temptations to dissipation, which are too apt to attract a young man of lively genius and extensive talents, Mr. Stuart employed the greatest part of his time in such studies as tended to perfect himself in the art he loved. He acquired a very accurate knowledge of anatomy; he became a correct draughtsman, and rendered himself master of geometry, and all the branches of the mathematics, so necessary to form the mind of a good painter: and it is no less extraordinary than true, that necessity and application were his only instructors. He has often confessed, that he was first led into the obligation of studying the Latin language, by a desire to understand what was written under prints, published after pictures of the ancient masters. As his years increased, knowledge attended their progress: he acquired a great proficiency in the Greek language; and his unparalleled strength of mind carried him into a familiar association with most of the sciences, and principally that of architecture. His stature was of the middle size, but athletic. He possessed a robust constitution, invincible courage, and inflexible perseverance. Of this the following fact is a proof: a wen, in his forehead, had grown to an inconvenient size; and, one day, being in conversation with a surgeon, he asked him how it could be removed. 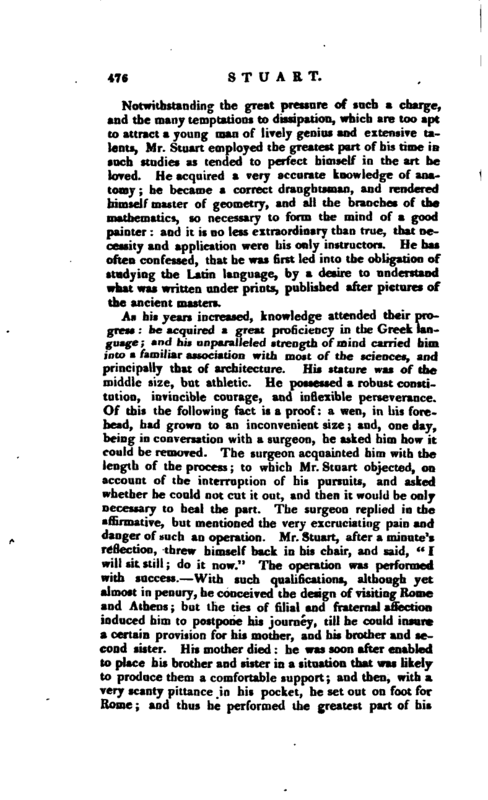 The surgeon acquainted him with the length of the process; to which Mr. Stuart objected, on account of the interruption of his pursuits, and asked whether he could not cut it out, and then it would be only necessary to heal the part. The surgeon replied in the affirmative, but mentioned the very excruciating pain and danger of such an operation. Mr. Stuart, after a minute’s reflection, threw himself back in his chair, and said, “I will sit stil! do it now.” The operation was performed with success. With such qualifications, although yet almost in penury, he conceived the design of visiting Rome and Athens; but the ties of filial and fraternal affection induced him to postpone his journey, till he could insure a certain provision for his mother, and his brother and second sister. His mother died: he was soon after enabled to place his brother and sister in a situation that was likely to produce them a comfortable support; and then, with a very scanty pittance in his pocket, he set out on foot for Rome; and thus he performed the greatest part of his | journey travelling through Holland, France, &c. and stopping through necessity at Paris, and several other places in his way, where, by his ingenuity as an artist, he procured some moderate supplies, towards prosecuting the rest of his journey. When arrived at Rome, he soon formed an intimate acquaintance with Mr. Nicholas Revett, an eminent painter and architect. From this gentleman Mr. Stuart first caught his ideas of that science, in which (quitting the profession of a painter) he afterward made such a conspicuous figure. During his residence at Rome, he studied architecture and fortification; and in 1748 they jointly circulated “Proposals for publishing an authentic description of Athens, &c.” For that purpose, they quitted Rome in March 1750, but did not reach Athens till March 1751, where, in about two months, they were met by Mr. Wood and Mr. Dawkins, whose admiration of his great qualities and wonderful perseverance secured to him their patronage. Dawkins was glad to encourage a brother in scientific investigation, who possessed equal ardour with himself, but very unequal resources for prosecuting those inquiries in which they were both engaged; having at the same time so much similarity of disposition, and ardour of pursuit. During his residence at Athens Mr. Stuart became a master of architecture and fortification; and having no limits to which his mind would be restricted, he engaged in the army of the queen of Hungary, where he served a campaign voluntarily, as chief engineer. On his return to Athens, he applied himself more closely to make drawings, and take the exact measurements of the Athenian architecture. He left Athens in 1755, still accompanied by his friend Revett; and after visiting Thessalonica, Smyrna, and the islands of the Archipelago, arrived in England in the beginning of 1755. 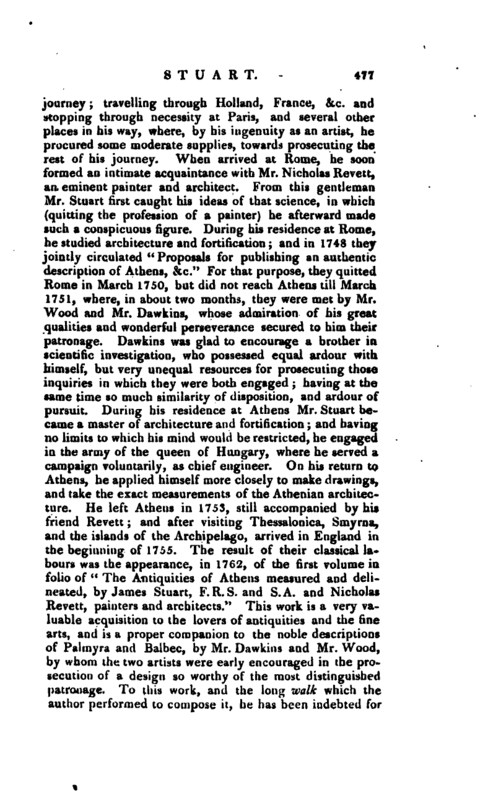 The result of their classical labours was the appearance, in 1762, of the first volume in folio of “The Antiquities of Athens measured and delineated, by James Stuart, F. R. S. and S.A. and Nicholas Revett, painters and architects.” This work is a very valuable acquisition to the lovers of antiquities and the fine arts, and is a proper companion to the noble descriptions of Palmyra and Balhec, by Mr. Dawkins and Mr. Wood, by whom the two artists were early encouraged in the prosecution of a design so worthy of the most distinguished patronage. To this work, and the long walk which the author performed to compose it, he has been indebted for | the name of the Athenian Stuart, universally decreed to him by the learned of this country. 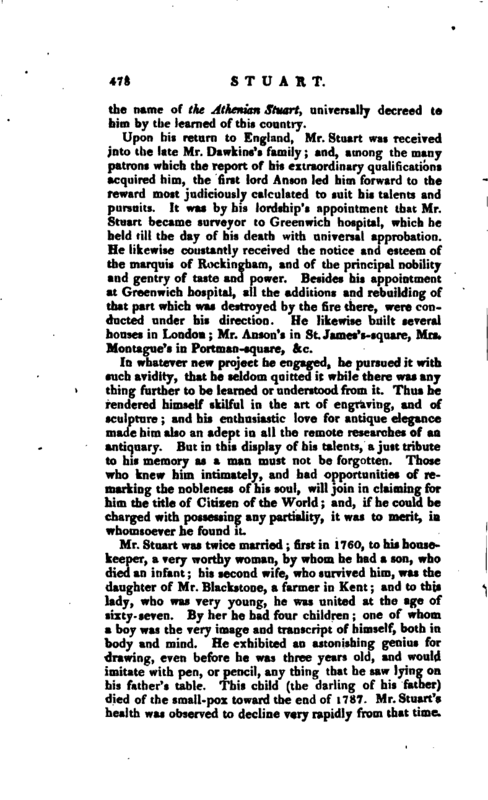 Upon his return to England, Mr. Stuart was received into the late Mr. Davvkins’s family; and, among the many patrons which the report of his extraordinary qualifications acquired him, the first lord Anson led him forward to the reward most judiciously calculated to suit his talents and pursuits. It was by his lordship’s appointment that Mr. Stuart became surveyor to Greenwich hospital, which he held till the day of his death with universal approbation. He likewise constantly received the notice and esteem of the marquis of Rockingham, and of the principal nobility and gentry of taste and power. Besides his appointment at Greenwich hospital, all the additions and rebuilding of that part which was destroyed by the fire there, were conducted under his direction. He likewise built several houses in London; Mr. Anson’s in St. James’s-square, Mrs. Montague’s in Portman-square, &c.
In whatever new project he engaged, he pursued it with such avidity, that he seldom quitted it while there was any thing further to be learned or understood from it. Thus he rendered himself skilful in the art of engraving, and of sculpture; and his enthusiastic love for antique elegance made him also an adept in all the remote researches of an antiquary. But in this display of his talents, a just tribute to his memory as a man must not be forgotten. Those who knew him intimately, and had opportunities of remarking the nobleness of his soul, will join in claiming for him the title of Citizen of the World; and, if he could be charged with possessing any partiality, it was to merit, in, whomsoever he found it. 1 Nichols’s Bowyer. Life prefixed to vol. IV.